Hi everyone! I know Christmas Day has been and gone, but I still have some Christmas manis that I haven't yet shared. I've decided to combine the last few into this post as a sort of catch up. 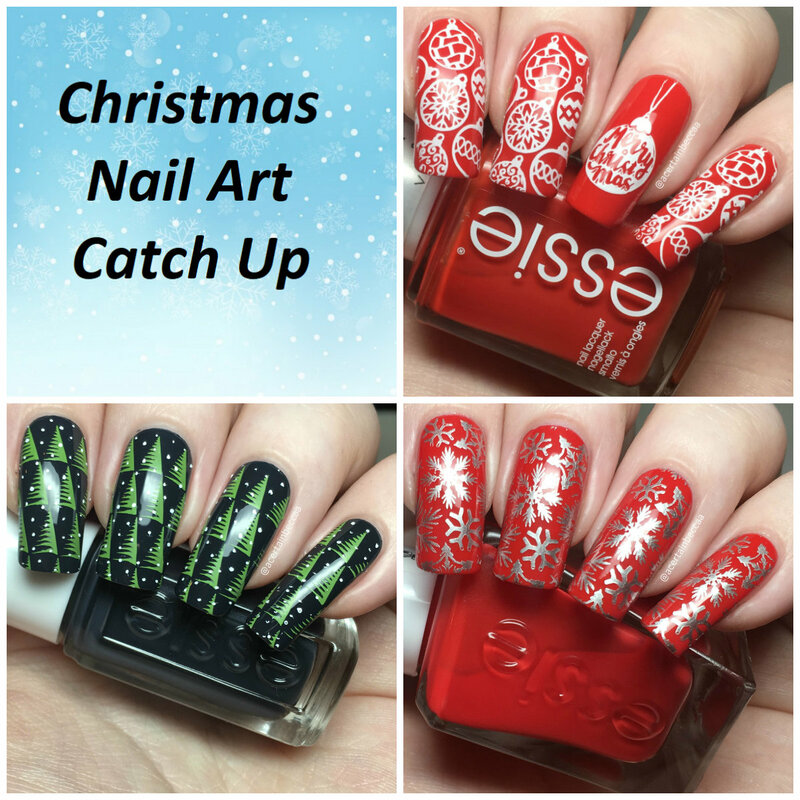 I have three manis in total, all using polishes from my Essie advent calendar as base colours, and UberChic Beauty Christmas plates. Read on for more info on each one! First up are these bauble nails over a base of Essie 'Fifth Avenue' (swatched here). I then stamped the bauble images using Hit The Bottle 'Snowed In'. 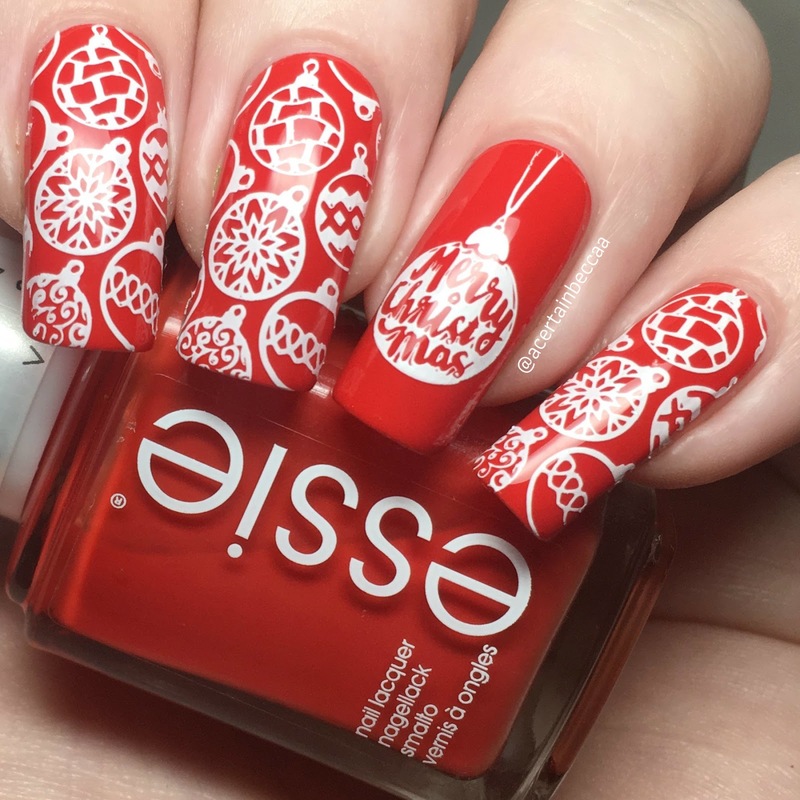 The full nail image is from UberChic Beauty plate Christmas-02 (now renamed Holly Jolly), and the singular bauble image is from UberChic Holiday Jingle. 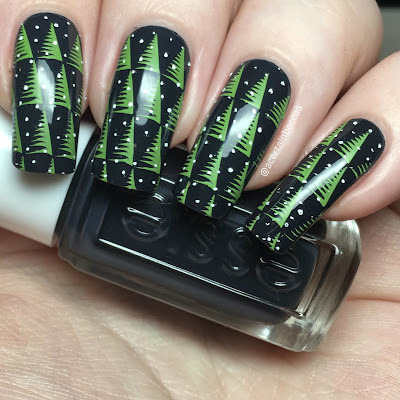 Next, I went for some snowy Christmas trees. I started with a base of Essie 'Bobbing for Baubles' (swatched here). For my stamping, I used UberChic Christmas-02/Holly Jolly. I stamped the tree image using Painted Polish 'Stamped in Greenery', followed by the snow imagine using Hit The Bottle 'Snowed In'. Finally, I have my Christmas Day nails. 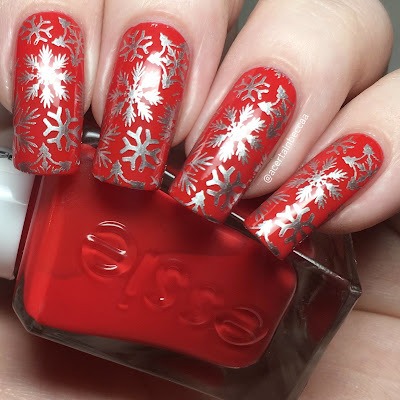 I stamped the full nail snowflake pattern from UberChic Christmas-01 (now renamed Holiday Spirit) using Barry M 'Silver Foil'. My base polish is Essie 'Rock the Runway' (swatched here). This mani is still on my cindy hand, and it's holding up really well with absolutely no chipping or wear! What do you think? 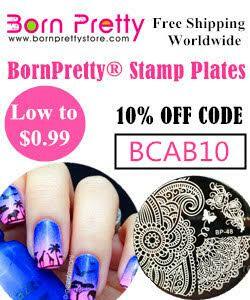 What did you have on your nails for Christmas Day? I still don't think I'm quite over Christmas and festive manis, I might sneak some more wintery ones in over January.